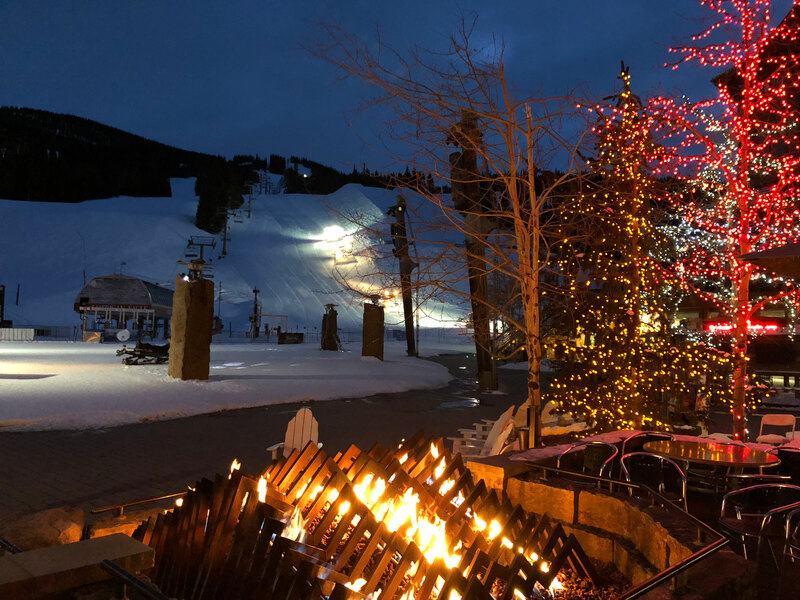 Copper Mountain is just 75 miles from Denver with 2,465 acres of skiable terrain and a great base village – an Intrawest design with rocky mountain style lodging and après ski steps away from the ski lifts. 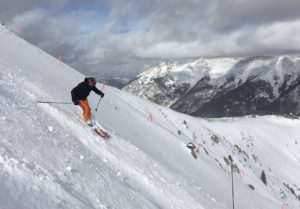 Copper is now owned by Aspen’s Alterra conglomerate, on the 2018-19 Ikon Pass. Parents will love its proximity off I70, the well-planned ski village, and the vast terrain variety. Kids will like that everything is geared toward them from ski and ride camps, to Woodward’s Parks, to the fun things to do besides skiing and snowboarding in the village. Copper is high elevation, which typically means dry light snow, the super scenic summit is over 12,300′, the base village is at 9,000′ so stay hydrated to acclimate on your first ski days. Copper Mountain’s terrain is ideal for families, so says the US Forest Service in fact, since its naturally divided by ability and includes fantastic bowl skiing at the upper elevations of 12,000’+ for advanced and expert skiers, and pleasant super-tame groomed terrain on the lower mountain, skiers left, at Lumber Jack and Union Creek for beginners and intermediate skiers and riders. Skiers right at Copper is grittier black diamond terrain that drops swiftly to the Resolution and Alpine fixed grip chairs. Many great cruisers are reached by 3 centrally located base six-pack chairs, the Super Bee, the American Eagle chondola and American Flyer. With over 2,400 acres there is so much to ski at Copper. Off slope, Copper offers families a beautiful mountainside village, three actually with the Center Village, East and West with tons of condominium accommodations, and a free shuttle. 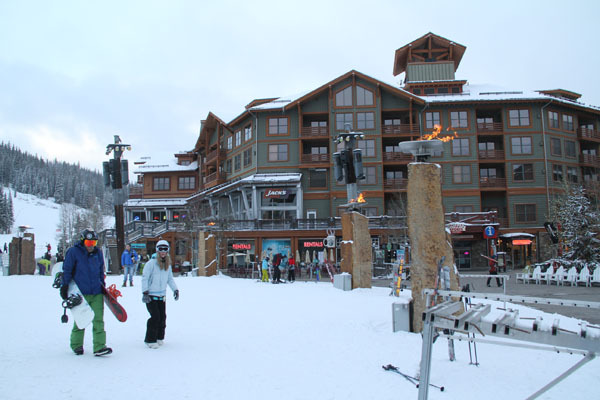 We recommend staying in Center Village for the best proximity to walk to restaurants, bars, shops, and ski school. Ask for a newer unit in this convenient Intrawest designed village. 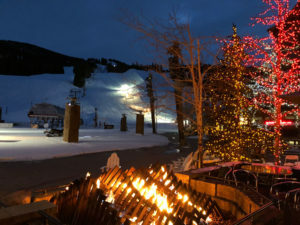 Apres Ski at Copper in Burning Stone Plaza is lively with bonfires, and slope view après ski bars like Jack’s with live entertainment during happy hour, and casual pub fare and drink specials, and kids menus, at Jill’s, Endos and Incline. For the kids, Copper has ice skating, snow tubing, snowshoeing, a kids-only lodge, climbing wall and Alpine Rush Zipline. There is also a Sports Center with indoor pool and Spa – accessible when you rent a condo at Copper. 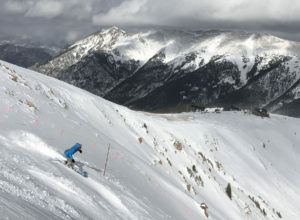 It takes three lift rides to reach the 12,224’ summit at Copper Mountain, and about twenty minutes – you can be skiing copious natural snow above tree line on Copper’s vast mountain peaks – the 12s (named for the elevation), which include Copper Bowl, Spaulding, Enchanted Forest and Union Bowl and Meadows. Up here you have wild and wonderful all-natural trails, chutes, glades and steeps at high elevation (think dry squeaky snow) that you can traverse or hike to. Ski Copper from the summit bowls to the base on Encore or Collage for an almost 3,000’ vertical, its breathtaking – from high-alpine down through heavenly snow-caked towering pines, long sweeping trails covered in fresh powdery snow typically well-groomed. Free cat skiing at Copper, catch the snowcat, free Friday-Sunday, up Tucker Mountain, you have to hike 30-minutes along the ridge to reach the top after the cat ride, for untouched steep and often deep snowfields down into the trees back to the Black Jack lift. Its a big adventure, operated and monitored by ski patrol, but not groomed and not for the timid or easily winded. Copper is home to amazing terrain parks, a huge Superpipe with 22′ walls, a monster terrain park – Woodward’s Central Park, and the Woodward Copper Camp that serves as training facility for talented young free skiers and riders open both winter and summer, on snow and indoors. 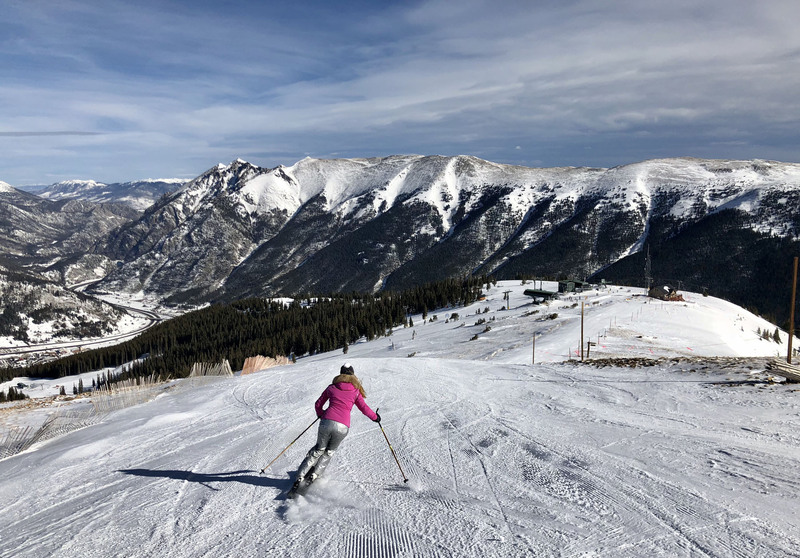 Also Copper Speed Training Center provides an impressive downhill practice arena for our US Alpine Ski Team and often hosts major early season races and ski events by the Super Bee chair in East Village. Families will find a gold mine skiing Copper for a week, midweek skiing is a particular find since Copper is so close to Denver on the I70, it can get busy on prime weekends. You can also combine Copper with a ski trip visiting Vail, Beaver Creek, Keystone and Breckenridge, or Winter Park – all nearby, even Steamboat is just two hours away. Copper is a Top Colorado Ski Resorts for a Family Ski Trip.